Last week, at the latest round of Trans-Pacific Partnership (TPP) negotiations in San Diego, California, the U.S. Trade Representative (USTR) announced that it has proposed a new provision on limitations and exceptions to copyright. It's nice to hear about a proposal that seems to expand limitations like fair use, and it is also nice to see that – finally - the USTR is listening to the technology industries. However, the draft treaty itself is still secret so the implications of this new provision are in fact ambiguous. We can’t know what their proposal means for copyright without knowing what’s in the rest of the chapter. It could be good, it could be bad, it could be indifferent, it could be LOLCATs. The TPP agreement has been framed by the USTR as a 21st century agreement, but we’re still not convinced it’s an agreement adequate for 21st century society-- especially in an environment where the public, Congress, and civil rights organizations are denied access to the treaty’s official text, while corporate representatives have full access to it. In a world where you can access the complete state code of Utah in Github to engage citizens in legislative drafting, secrecy and backroom deals are not exactly a 21st century way to build the 21st century society. The TPP is a major threat because it will rewrite the global rules on IP enforcement. 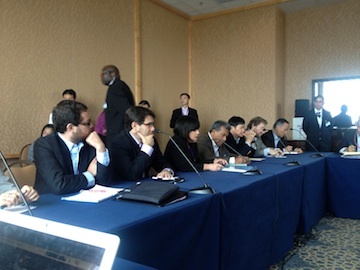 It will begin with the APEC members, binding the U.S. and other nations to SOPA-like standards. EFF was in San Diego raising awareness about the risks of an IP-maximalist agenda that has been pushed forward by powerful U.S. government. At the stakeholder events, we spoke to an audience of negotiators on the risks of technological protection measures (TPMs) and interacted with delegates and distributed material with detailed policy analysis of what we know about the TPP’s intellectual property provisions . 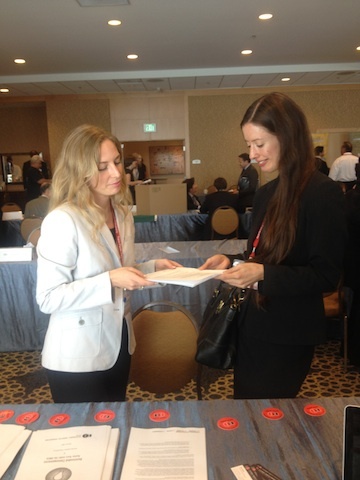 International Intellectual Property Director, Carolina Rossini, speaking with a stakeholder. In addition, we participated in rallies, in a public forum organized by Occupy San Diego, and pushed out a statement with other public interest groups in quick response to the USTR’s new proposal on fair use. 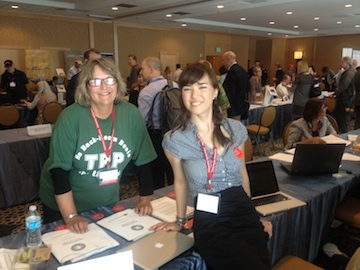 International Intellectual Property Coordinator, Maira Sutton, with a representative of Occupy San Diego. Expanding limitations and exceptions (L&E) are a key part of EFF's international IP policy agenda. L&E are legal flexibilities in copyright that provide balance in a copyright system between users and creators of protected works. Fair use, first sale, and special provisions for software backups and interoperability, education, and libraries are all L&Es. They are fundamental for access to knowledge and for human, social, and economic development. They ensure that copyright policy functions for both the creators and the users. This spirit of balance is supposed to flow through all copyright laws, so that the law guarantees both the incentive to create new works and the ability of society to use and comment on them. The balance is supposed to be created through ideas like exceptions and limitations, including fair use   . This balance allows journalists, scholars and the general public to quote from and comment on others' writings, and artists and the general public, to create parodies and to practice basic rights of free expression. And it also generates economic value and jobs. But the rights of owners have grown far faster and larger than the limitations, and that is one of several reasons why the current state of copyright is so completely out of balance. In the USTR blog post, the provision proposed will supposedly obligate Parties “to seek to achieve an appropriate balance in their copyright systems in providing copyright exceptions and limitations for purposes such as criticism, comment, news reporting, teaching, scholarship, and research.” Remember, we haven’t been able to read it yet. The actual language isn't yet accessible by anyone other than the delegates and a few industry representatives. One key part of the proposed provision may be based on the internationally-recognized "3-step test." The 3-step test is a classic piece of copyright jargon. It is a piece of law that emerges from one of the most important international copyright instruments, the Berne Convention for the Protection of Literary and Artistic Works. And what it does is create a set of minimum restrictions on copying that cannot be lowered by individual member countries in their own copyright laws. Even if the U.S. eventually flips from its current position and wants to radically rebalance copyright law to bring it into the 21st century, the international community could apply this vague 3-step test against it and prevent the U.S. from doing so. William Patry has written extensively on the 3-step test, the debate around it, and its potential to chill the expansion of limitations and exceptions as part of rebalancing copyright law. KEI also provides some history on the 3-step-test. The Three-Step Test has already established an effective means of preventing the excessive application of limitations and exceptions. However, there is no complementary mechanism prohibiting an unduly narrow or restrictive approach. For this reason, the Three-Step Test should be interpreted so as to ensure a proper and balanced application of limitations and exceptions. This is essential if an effective balance of interests is to be achieved. EFF agrees with that and believes that it is vitally important that exceptions and limitations to copyright be protected in international trade agreements. Asia-Pacific Economic Cooperation, a forum for 21 Pacific Rim countries seeking to promote free trade and economic cooperation throughout the Asia-Pacific region.